Happy Election Day Eve! If you’re working for a nonprofit and want to encourage people to vote here is a good nonpartisan link: https://gettothepolls.com/ from The Voting Information Project. We have an adjusted schedule this week and next week because of the election. We’ll be doing the planning blueprint training on Wednesday and all of next week we are digging in on the Campaign Digital Debrief 2018 [Virtual Summit]. It’s free to join and everyone working for social good nonprofits (i.e. NRA and those promoting division aren’t welcome), left-leaning political campaigns, and civic organizations are welcome. At their core, successful organizations, campaigns, and projects are successful planners. Author of “The Digital Plan” presents the core Digital Project Planning template and it’s core elements: developing focused and actionable goals; implementing a decision-making grid system; advice on what to include in your plan for success. After the training, you’ll be better equipped to outline your projects and focus on the goal and tactics that will move you forward. Key takeaway: Project ready Digital Planning Blueprint and concise advice for putting it into action. As we near the end of the electoral cycle campaigns and many projects will come to a close. 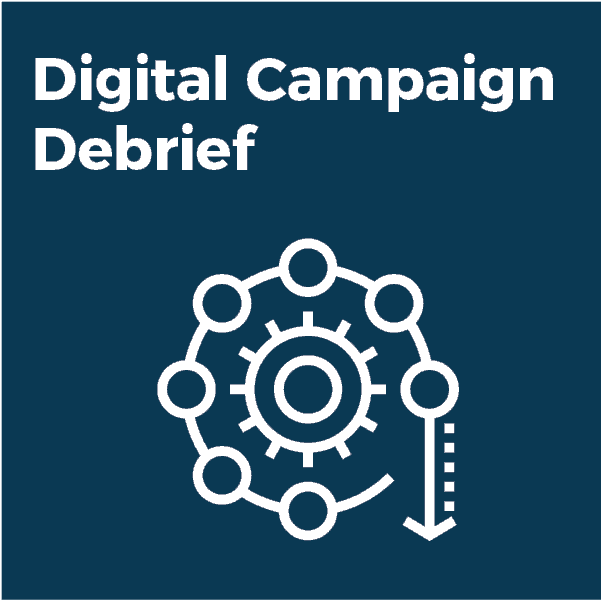 Having a plan to brief your digital strategy and campaigns can be invaluable. Too often win or lose we just move on without debriefing what worked and what didn’t. We’ll talk through debrief strategies and a worksheet to help you get valuable information for future campaigns. Key takeaway: Campaign debrief strategy and a worksheet to guide you.